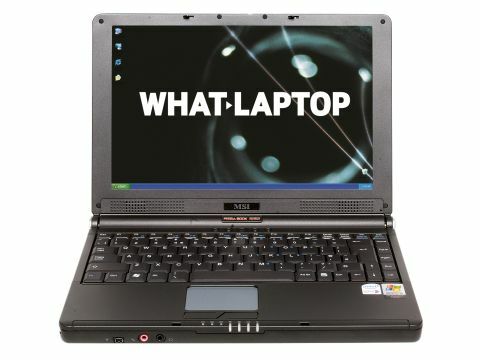 Known for making motherboards and other PC components, MSI is relatively new to the laptop market. Because of this, it hasn't had the time to truly refine the design of its laptops. The Megabook S262 (£999 inc. VAT) attempts to address this, featuring an impressive specification. It uses a standard chassis, which means it looks similar to cheaper MSI machines. The extra expense has been spent on components - the Megabook S262 uses an Intel Core 2 Duo processor, the 2.16GHz T7400 chip. This is a dual-core chip, meaning you'll be able to perform several tasks at the same time without delay. We found performance to be outstanding, with no lag even when running intensive applications. This was borne out by an impressive MobileMark 2005 score of 273. The Megabook sets itself apart from the norm by virtue of its 12-inch screen. This helps to keep weight down to just 2.1kg, and offers the portability to take it with you wherever you go. A glossy Super-TFT coating makes images bright and colourful. As is often the case with smaller machines, the graphics card is integrated, compromising 3D performance. In this instance, Intel's 945GM adapter is in place, which is an up-to-date solution able to cope relatively easily with office applications and DVDs. Despite the small screen, MSI has fitted a decent-sized keyboard. The keys are large, with only the secondary keys being slightly cramped. It's not the most responsive keyboard we've seen, and needs to be struck firmly to register. The keys are well attached, although the keyboard flexes under pressure. While the screen and chassis are both sturdy, some of the trim - such as the silver edges of the screen hinges - could be more firmly attached. Heat build-up within the chassis is well contained, although the right side of the machine did heat up slightly after long periods of use. In addition to impressive performance, you'll find a useful range of standard features included. An 802.11a/b/g wireless adapter is built-in, and there's also Gigabit Ethernet, enabling fast network connections when you get into the office. A multi-format DVD rewriter lets you back up your files to all current forms of DVD disc, and there's also a 4-in-1 card reader for transferring files from your digital camera or Pocket PC. Although not perfect, the Megabook S262 is a vast improvement over previous iterations. The swap to Intel processors has given performance a much-needed boost, and there's a lot on offer from this highly portable machine.